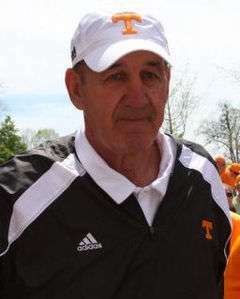 Monte Kiffin (born February 29, 1940) is an American football coach, currently serving as the assistant head coach of defense for the Jacksonville Jaguars of the National Football League (NFL). He is widely considered to be one of the preeminent defensive coordinators in modern football, as well as one of the greatest defensive coordinators in NFL history. Father of the widely imitated “Tampa Cover 2” defense, Kiffin's concepts are among the most influential in modern college and pro football. A native of Lexington, Nebraska, Kiffin was an offensive and defensive tackle at the University of Nebraska–Lincoln from 1959 to 1963. In 1966 he played 8 games with the Toronto Rifles of the Continental Football League and also was a member of the Brooklyn Dodgers of the same league. After a brief stint as a defensive end for the Winnipeg Blue Bombers, Kiffin returned to Nebraska as a defensive coach. Kiffin was the defensive coordinator at Nebraska under legendary coach, Bob Devaney. He coached the defenses of Nebraska's 1970 and 1971 back-to-back undefeated national champion teams. After then offensive coordinator Tom Osborne was selected as the head coach in 1973, Monte stayed as the defensive coordinator for four years. In 1977, he moved to the University of Arkansas, and then in 1980, he got his one and only head coaching job at North Carolina State University. Kiffin then began a series of short stints in the NFL for the Green Bay Packers, Buffalo Bills, Minnesota Vikings (twice), New York Jets, and New Orleans Saints. In 1996, he became the defensive coordinator for the Bucs. Kiffin's sons are both football coaches. Elder son, Lane Kiffin, played football at Fresno State before entering coaching: becoming the head coach of the Oakland Raiders, Tennessee Volunteers, and USC Trojans, and is currently the offensive coordinator and quarterbacks coach for the Alabama Crimson Tide. Younger son, Chris Kiffin, played football for Colorado State and is now the defensive line coach for Ole Miss, having followed head coach Hugh Freeze from Arkansas State. 1 2 Mullen, Bryan (2008-12-15). "Kiffin's dad enjoys sterling reputation". The Tennessean. ↑ Shelton, Gary (2008-12-28). "Tampa Bay Buccaneers defensive coordinator Monte Kiffin is worthy of fame". St. Petersburg Times. ↑ Cummings, Roy (2008-12-14). "Kiffin Confirms He's Leaving Bucs For Tennessee". The Tampa Tribune. ↑ Evans, Thayer (2010-01-13). "USC Football: Kiffin, on the move, is a man of Troy". San Francisco Chronicle. The New York Times. Retrieved 2010-02-22. ↑ Kavner, Rowan. "Monte Kiffin Officially Hired As Cowboys' D-Coordinator". DallasCowboys.com. Retrieved 2013-01-13. ↑ Orr, Conor (March 21, 2016). "Jaguars hire defensive coaching legend Monte Kiffin". nfl.com. Retrieved March 21, 2016. ↑ Chris Kiffin, olemisssports.com, accessed January 22, 2013. Shelton, Gary (August 18, 2009). "For former Tampa Bay Buccaneers defensive coordinator Monte Kiffin, it's still game on". St. Petersburg Times.